Rubber Tip Air Hose Nozzle. To be used on the end of a compressed air hose. 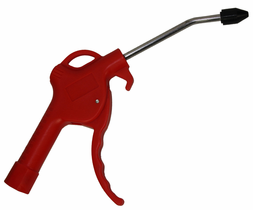 4" rubber tipped nozzle provides a steady stream of air flow. Perfect for cleaning microfiber pads on the fly! Heavy duty polyurethane mold is in red for easy detection in the shop. Use to blow dry remaining water retained in side mirrors and other vehicle cracks and crevices. Can also be used to blow out hard to reach debris when vacuuming and prepping interiors.